He Fulfilled My Secret Wish! Around this time last year, my weary spirit told God my top secret wish. I told this to Him not because I was asking Him to make it happen for me, but because I felt (and still do) intimately close to Him to let Him know what's in my heart. Totally forgot about it... let it go... and then went on about with what I had to do... and ultimately did what He specifically asked me to do during that season of my life. While I found pure pleasure in obeying His (very specific!) will... I must admit, I had my times where I felt discouraged, questioning my limited self if this was all worth it. I kept on doing it anyway just because it was clear to me He wanted me to do it. Because He is a Father who finds joy in seeing me smile, He fulfilled my secret wish this week! My husband, Robert (the only other one who knows about this wish), pointed this out to me last night. Obviously, I really let that secret wish go that he had to remind me about it! Overwhelmed by His goodness, we could not help but give Him praises right there in our car! I am absolutely thrilled God gave me something I wanted in His own perfect time! But more than that, He taught me a valuable, character-building lesson. He taught me not to be anxious. He taught me not to be too consumed by my own personal desires that blocks out His own will for me. Or worse than that, He taught me not to twist my personal wants in such a way that I make it appear like it is His will in my head. Boy, was I guilty of that several times in the past! He taught me to fully surrender. He taught me trust Him unconditionally. And He will make the rest happen. 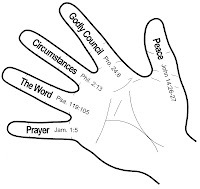 *Note: If you find yourself actively seeking God's will on on something specific in your life, I encourage you to follow the hand diagram. It has worked for me so many times! thanks for the reminder, happysammy! =) my job-hunting has been fruitless thus far but i'm just holding on tight and trusting that His timing is perfect. love your blog! miss you heaps!